I am about to purchase from a good friend an original 25mm Party badge in Gold, its athenticity in not the question however I am sure that it will end up being such. 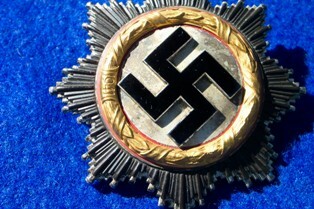 The badge with a few other items was taken from a very famous German by my friends grandfather who was a British Officer in the War. The issue number is 18 which is pretty low. I now have the problem of how much do I offer and will anyone ever believe that it is correct!! If any one can confirm the NSDAP number I would appreciate it. 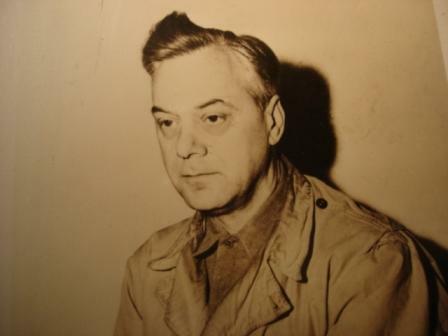 The German in question was one of the 12 hung in the first days of the Nuremburg Trials. I have not got any photo's yet however I have seen it many years ago. Welcome to GMIC When you get the photo's post them, remember that as a new member you are restricted in the size of your posting's. Looking forward to viewing the photo's, such a low number will be interesting. I hope that these photo's are ok, there was a German cross and a German Army Dagger to. That is one SUPERB badge! Thanks Robin, coming from you that means a lot to me. I am pretty sure that it was Alfred Rosenbergs. I got this information from the BUNDESARCHIV in Berlin, there has been a little confussion which is why I asked becuase Roenberg also had the number 625. No problem. That is simply the best GPB I have seen........including all these 'AH' etc. types. That thing just screams at you. Unfortunately, I don't know who '18' related to. Julius Schaub's badge was numbered '81' and sold back in 1982 for ?1300. Obviously, that was almost 25 years ago. If that IS Rosenberg's badge, it's worth a small fortune. I have no doubt that someone here will know the answer.......perhaps 'Gold Party Badge Guy' who is a specialist in this area. I have just had confirmation that this was Alfred Rosenberg's which is really nice to know, his party number changed from 625 to 18 in 1925. I now have to dig out the surrender details to find out how the German cross in Gold and a Army Officer Dagger come into it, was he acting as a German Officer during his capture. There is also a German Russian front fur coat which he was wearing at the time. If any one has any ideas on how to find out about this I would very much appreciate it. I now have the family trying to find out what happened to the rest of the collection. I know that there was a lot of sporting guns as well, which have long since gone!! Congratulations on this fantastic piece of history! We've been corresponding off line about this badge, so I'll publicly add my 2 cents. As Robin says, a very nice badge - wonderfully original and hsitorically important. I haven't been able to track #18 yet. Rosenberg was #625 of the old DAP (see his Nuremberg trial transcript) but was reisued a new NSDAP number in 1925 on the refounding of the Party. It was probably a very low one based on his historical seniority and his keeping the NSDAP going while Hitler was in Landesberg Prison. Rosenberg was neither honourary SS or SA, so he doesn't appear in the standard lists. His NSDAP number is surprisingly hard to find in Party lists. Being a small Deschler, it would not have been worn in uniform, and you'd have to be pretty stupid to be wearing it while walking around in May 1945. I agree, he would have to be mad wearing this badge however I do remember my friends Father saying before he died that his Father had a lot of sporting guns from him as well, this might indicate that he had been to his house! !, which might account for how he got it. I have a book titled "Hitler and the Nazi leaders" by Ian Allan who says that he was a "Honorary SS General"?, It also shows his Detention card which shows him wearing a political uniform I believe, however it is hard to see because of the card in front of him. 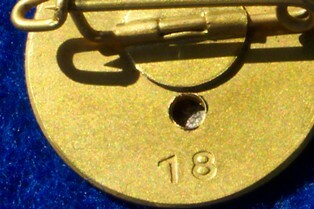 Who ever number 18 is he was hung on the first day, so that does reduces the search to 12 people. I remember my friends Father also saying that he heard his Father jumping for joy when he heard that the Officer in question was Hung at Nuremburg. 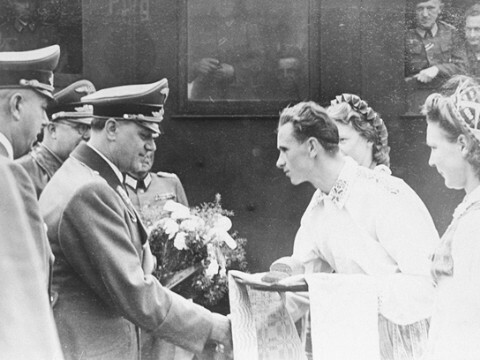 DR. THOMA: How did you come to the NSDAP and to Hitler in Munich? ROSENBERG: In May 1919 the publisher of the journal which I mentioned was visited by a man by the name of Anton Drexler, who introduced himself as the chairman of a newly founded German Labor Party. He stated that he advocated ideas similar to those expressed by this journal, and from that time I began to have connections with a very small group of German laborers which had been formed in Munich. There in the autumn of 1919 I also met Hitler. DR. THOMA: When did you join Hitler? ROSENBERG: Well, at that time I had an earnest conversation with Hitler, and on that occasion I noticed his broad view of the entire European situation. He said that in his opinion Europe was at that time in a social and political crisis, such as had not existed since the fall of the ancient Roman Empire. He said that seats of unrest were to be found everywhere in this sphere, and that he was personally striving to get a clear picture from the viewpoint of Germany's restoration to sound conditions. Thereupon, I listened to some of the first speeches by Hitler which were made at small meetings of 40 and 50 people. I believed, above all, a soldier who had been at the front, and who had done his duty silently for 4 1/2, years, had the right to speak now. At the end of 1919, I entered the Party-not before Hitler, as it is contended here, but later. In this original Party I was assigned Number 625 as a member. I did not participate in setting up the program. I was present, however, when this program was read and commented upon by Hitler on 24 February 1920. DR. THOMA: Rosenberg-35. This deals with machinery which had a value of 180 millions and was delivered to the Ukraine-agricultural machinery. Witness, were you a member of the SA or the SS? ROSENBERG: No, I belonged neither to the SA nor the SS. DR. THOMA: So you have never worn an SS uniform? A small party badge for a senior NSDAP member who is an officeholder ("Hoheitstrager") would probably sit in a drawer at home, which is why it is in such good shape. 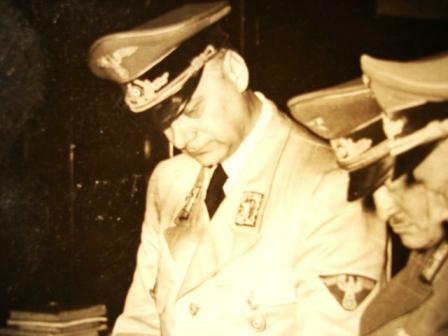 Here is Rosenberg in his two uniforms - one as Reichleiter and the other as Reich Minister for the Eastern Occupied Territories. As confirmed above, Rosenberg was never in the SS. This was always a bone of contention with Himmler, as Rosenberg proved a continual thorn in the side of the SS while Reich Minister for the Occupied Eastern Territories. In short, the SS wanted to work the eastern population to death, while Rosenberg wanted to keep them fit enough to serve the armaments industry/war production for the long haul. Himmler offered Rosenberg an SS General's rank on several occasions (keeping in mind that all SS men owed a personal allegiance to Himmler), but Rosenberg told him to 'get stuffed'. He thereby maintained his independence from the SS, which was no mean feat in the east. 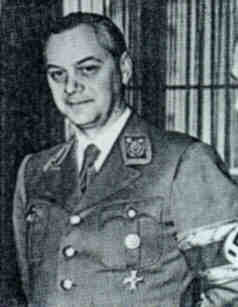 Himmler's race chief in Russia, SS-Gruf. 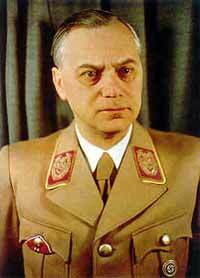 Hofmann, said at one point that 'The East would belong to the SS'. Rosenberg prevented that. Thanks for the help guys, I did try to reply just now but I do not think that it got through, if I end up repeating myself do not worry, this site is new to me!! I have just looked at Jamie Cross's Golden Party List and 18 is on it, so I have sent an e-mail to ask who he thinks that it is. 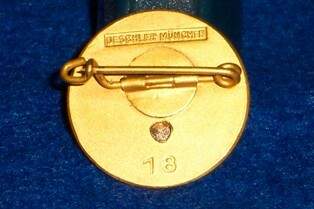 I have attached a copy of the German Cross, it is numbered 20 under the pin and is a 4 hollow rivet construction. The heavy version I believe. Thanks it is a lovely find, I Remember my friend telling me about 15 years ago that his Dad had some german badges and said that he thought that it was 13 at the time, it was that low and I had never seen one before that I thought that it was a RZM number. I have promissed the family that it will not be sold, so do not start checking e-bay. and if you do see one for sale ignore it!! I have found what you are looking for. 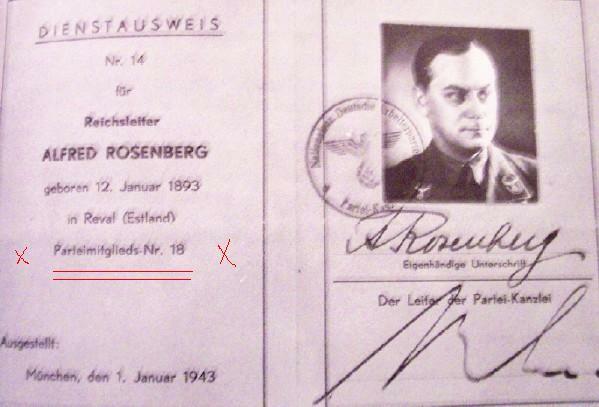 Here is Alfred Rosenberg's Reichsleiter's ID card, signed by Bormann. It shows clearly that Rosenberg's NSDAP number was 18. So far as I'm concerned, that is incontravertible proof that the badge you have belonged to Rosenberg. Rosenberg was one of the oldest of the Old Guard........for a purist collector of these badges, I think your badge could only be beaten by someone coming up with Hitler's......and that ain't going to happen. Congratulations Taff. You've got one of the most desirable GPBs in the world. No exaggeration. Wow!! Thanks Robin that is amazing!! it has been thrown in the back of a cupboard in a very old house for years, my friends Father thought that it was Ribbentrop, but this has confirmed it. I am amazed after reading so much about Rosenberg, I did not realise how inportant he was. It's a pleasure to help out a GENUINE guy. What a fascinating story - - - thank you for sharing it. 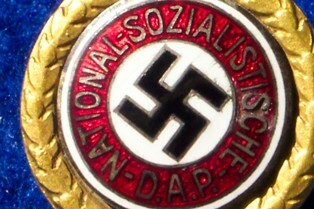 I have collected NSDAP and related material for over thirty years now and never seen anything close - a truly unique piece !! Thanks Guys It is amazing, I have been collecting Military items for thirty odd years as well and I cannot believe it either. I have seen the books saying rare badges under a 1000 but under 20 and to such an inportant person. Again thanks for everyone who helped trace it especially Robin!! I owe you a pint or two!! !